“No” – it’s a small word that packs a lot of power. It carries with it an invisible force that can make it feel like overly oppressive, or even like a dirty word. We’re often taught that saying “no” is a negative thing, that it hurts those around us and causes us to miss out on new, exciting opportunities. It’s no wonder so many people are uncomfortable saying it. But the truth is, when you say “no,” you’re not saying “I hate you,” and you’re not insulting someone, you’re simply exercising your right to say “no.” Because it is a right, not a privilege. So, why do so many people have an issue telling someone else “no”? The truth lies not in the obvious – a need to please – but rather in the fact that some of us have the tendency to put others’ objectives above our own. Our inability to say “no” stems from the fact that we want to reassure and make others feel comfortable is a notion you need to shake, immediately. Being unable to say “no” is not only unfair to ourselves, but it can be unfair to the other person as well. Disregarding our own feelings and needs seems like the unselfish thing to do. After all, we are taught to give, not take. But, just because it’s easier to say “yes” doesn’t mean we should. Think about times when you’ve agreed to do something, be it in your professional or personal life, and later resented yourself or the person who asked you for something later. How did that make you feel? Didn’t you wish you could go back in time and tap into your right to say no? Sometimes giving yourself a moment to pause, assess the situation and decide if it’s really beneficial to you and others is a much stronger option. 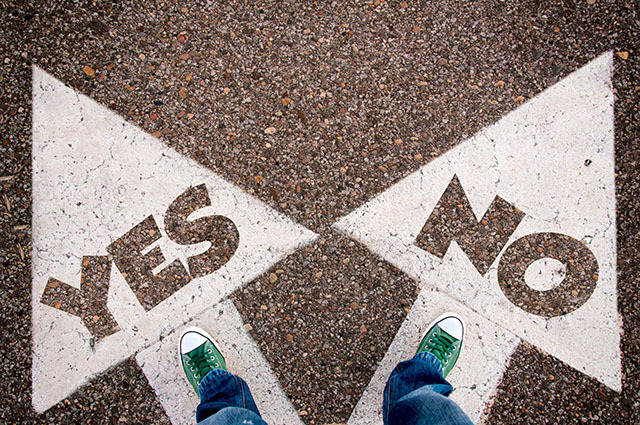 What if “no” would result in a better outcome for both parties? Saying “no” doesn’t have to mean you’re being self-serving. Say, for instance, a coworker asks you to crank out a last minute project over the weekend. You could agree to do so immediately, as you want to be seen as a team player. But when you really think about it, there are flaws in your coworker’s idea. If you follow through on this project, you’ll not only be wasting your time working on something that hasn’t been properly thought out, but you’ll also be taking time away from your family and friends over the weekend. The power of no can be beneficial for all parties involved sometimes. Of course, if a hard “no” is still too difficult to say, there are other ways to state it. For instance: “I choose not to,” “Not at this time” and “That will not work for me” are all different ways to say “no” that don’t feel quite as harsh. Practice turning others down and get more comfortable in your right to say no. And remember, it is your right to decide how you spend your time. In the end, remember, it’s your right to say no. It doesn’t mean you’re exercising some sort of immutable ego trip. It means you’re saying “no” because the proposed ask doesn’t suit your schedule or beliefs – and that’s okay.